Some last-minute (sort of, anyway) substitutions at the Barbican last night resulted in one of the most hair-raising and astounding concerts I've been to in years. First substitution was that Gergiev/LSO dropped the Love of Three Oranges suite and The Miraculous Mandarin and threw The Rite of Spring into the first half, presumably because they can all play it in their sleep (rehearsal time may have been an issue, given Gergiev's punishing schedule of gargantuan Russian operas with the Mariinsky tonight & the next few days, hem hem...). I thought I could do without the Rite right now, especially in the Barbican's enhanced acoustic - it is b****y loud - but this was riveting: fast and savage with bells-up horns, slow and sensual with dug-in strings, Gergiev using the minimum of gesture except for those long and amaazing sculptor-hands twiddling and twirling. And remember - from the stalls, you can't see his eyes. Rite as curtain-raiser rather than climax? Oh yes. Switch on the heat and bring on the Bartok. And bring on the Russian mezzo. Katarina Dalayman was absent and in her place there materialised a size-zero supermodel with a fountain of golden hair to beyond her waist, a glittering pink dress and a great big, gorgeous and dramatic voice that had the audience at her feet in nanoseconds. Elena Zhidkova has sung a range of top mezzo roles - Carmen, Dorabella, Orlofsky and Oktavian, and even some Wagneries - but she seems born to be Bartok's Judit, and with Willard White as her Bluebeard, there was no need for scenery, special effects or even the surtitles. Her acting is so vibrant - as she stands transfixed on that top note as the fifth door opens, batters physically with her fists at the seventh door or pleads finally for mercy from goodness knows what as Bluebeard names her the Bride of Night - that one could follow the story without the words (I take my hat off to any non-native who can sing in Hungarian in the first place). I could only find one photo of her on the internet (above left) and the only biography, except for the quickly-printed extra page in the programme, was in German. But there is going to be some serious hat-eating in Sheen if this phenomenal girl is not up there with the Kozenas and Bartolis in two or three years' time. As for the rest: Gergiev, orchestra and Sir WW produced shivers and shakes and visions of horror and glory that told us - and we do need reminding sometimes - everything that music can do to the human body and soul, at the deepest, darkest level. On a more mundane note, Bartok's black magic out of Transylvania set me pondering whether it bears any relation to a novel by one Bram Stoker, published in 1897. (Download the e-book free at Project Gutenberg here.) Do the legends share an origin? And why? As a Romanian soprano pointed out to me a week ago, Dracula, or its author, is neither Hungarian nor Romanian but English (and since some call her La Draculette, she should know...more about her soon...). But vampiric legends go back further in that part of the world...Walter Starkey's lurid memoir Raggle-Taggle, which I devoured in a fascination of dubious delight during background reading for Hungarian Dances, is full of them. Why did Stoker pick Transylvania? What were his sources? And Maeterlinck's play Ariane et Barbe-Bleu was published in 1899, two years after Dracula, and was adopted by Dukas for his opera; linking Perrault's legend to Greek mythology...What happened? Why these tales, at that time? I have lots of questions, but no answers. Anyone like to discuss? UPDATE, 12.25: This was the second of two performances of the programme, and Hilary Finch reviews the first here - all just too much, apparently, but I think she could safely have added the extra star she hints at for this second show. Hearing that Bogdan Roscic, MD of the Decca Music Group, is pushing off to become president of Sony Classical reminds me rather of the numerous Poles one sees these days at British airports, heading for flights home. Why would anybody in their right mind (which he is) leave Universal Classics - the big one, the quality one, with JDF, Kaufmann and Bartoli to name but a few - to work for a label that's distinctly less glitzy? A brief news story in Gramophone carries the ominous sentence: "Decca is being subjected to considerable scrutiny prior to an expected restructure by Universal Music." I know that my estimable readers are just as capable as I am of reading between the lines, so I won't elaborate. Well done, all. Yes, it is of course the making of a grand piano - and The Omniscient Mussel is spot-on. They are bending the frame and clamping it in place. I took the photo during a tour of the Steinway factory in Hamburg on Monday. Lots of good pics, so I will put them on Facebook as soon as I have a spare moment. The reason for the trip will become apparent in due course! Love the captions, glad I decided not to give a prize as I wouldn't be able to choose! 1: What is going on in this photo? Funny. Nobody seems to have noticed that the opening night of Erich Wolfgang Korngold's Die tote Stadt at Covent Garden was on 27 January - a) birthday of Wolfgang Amadeus Mozart, b) Holocaust Day (or the other way round if you prefer). First reports are now in from Gavin Plumley at Entartete Musik (formerly Mr Norris, now has new name), plus Neil Fisher in The Times and a very ill-informed write-up from a site called Musical Criticism, which risks being sent a copy of my 1987 Cambridge University dissertation about the work's closely wrought and very distinct structural integrity. I'm not saying it's a perfect opera, but frankly neither is Elektra. When you've finished reading those, please go to the Indy and read Johann Hari on something completely different. Ed Seckerson in The Independent - "iridescent with desire" (!). A missing t nearly turns the title into 'the dead stadium'. Simon Thomas at MusicOMH: "This is a dead city of the mind, cloaked in black, with windows into often nightmarish compartments of the psyche..."
George Hall in The Stage: "...a worthwhile show and a work that lovers of Strauss and Puccini will fall in love with." Alexandra Coughlan in The Oxford Times: "the opera is stuffed so explodingly full of melody that a Frenchman would have to be forcibly restrained from cutting out the overture and serving it with toast." The London Paper (the free thing you get on the train) says: "MORE GOLD THAN CORN". Yes, honest to goodness, they do! Interesting, balanced and beautifully written viewpoint from Anna Picard in The Indy on Sunday: "Bruges itself – a niche destination in Rodenbach's day, destitute, ramshackle and yet to be rebuilt for chocoholic day-trippers – is painted not in the sober greys of Memling but in the greedy gold leaf of Klimt... Far from being self-indulgent, Die tote Stadt is an uncomfortably frank examination of its characters' self-indulgences." a vitriolic little blogpost from Ivan Hewett laying into not Korngold but the estimable and extremely hardworking Michael Haas, record producer and curator par excellence, the brain behind Decca's amazing Entartete Musik series of the 90s and a variety of fantastic exhibitions at Vienna's Jewish Museum. Could Michael have a chance to defend himself, perhaps? I'm on BBC R3's Music Matters today, talking about Korngold Die tote Stadt and John Adams Dr Atomic - two operas involving dystopian futures, both opening in London in the next month. Looking forward to hearing what Gerald Finlay has to say about singing them both. Programme is available on Listen Again for a week afterwards. Thrilled to have a full house at East Sheen Library for our Hungarian Dances evening. I talked and read from the novel; Philippe Graffin (left) and Tom Eisner (right, in purple shirt) played Bartok Duos. With a good glass of wine and a little confusion over which violinist I'm married to [=Tom] the evening went with quite a swing! Huge thanks to the wonderful team from the library and Hodder for putting so much energy into this lovely occasion. Several people wrote to me beforehand to say they'd love to hear a podcast from it, but I'm afraid I don't possess the right technology and wasn't able to record. 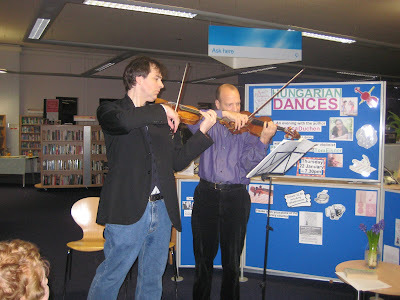 However, you can hear Philippe and Tom play the Duos on the Hungarian Dances CD, on the Onyx website, and here's the text of my introductory spiel. Maybe Ellie will be a writer… for any writer, running out of dreams would be a nightmare. You need your dreams, because this is where the creativity begins, or at least the oven where the ideas bake on a good slow setting. Hungarian Dances is the product of a number of different dreams that all imploded at once when I decided to write a novel about the violin. I’ve always had a thing about the violin, something that I’m afraid goes back possibly to when I fell in love with my violin teacher when I was 18, or possibly even further. My brother, who’s a lot older than me, is an excellent violinist and some of my earliest memories involve sitting on the stairs, listening to him playing sonatas with a pianist friend, wishing that I could join in. Funnily enough, last summer we put on a Hungarian Dances Concert of the Book and when Philippe and his pianist came round to rehearse, I found myself sitting on the stairs listening, thinking ‘this feels familiar…’. As many of you know, I’ve been trying to combine music and words in various ways for some time. I’ve been a music journalist for longer than I’d like to admit. I’ve written biographies of the composers Korngold and Fauré; my first novel was called Rites of Spring, named after Stravinsky’s ballet score, and my second, Alicia’s Gift, was about a child prodigy pianist. Music of course has inspired countless writers across the centuries, and somehow we writers who love music more than words always feel that music can speak to an audience’s emotions faster and more directly than spoken language. We hanker for its power! The paradox is that conveying music in words is actually impossible. Daniel Barenboim, whom I’ve interviewed several times, often points this out and he compares it, rather pertinently, to writing about God. You can’t really describe the thing itself, you can only describe the effect it has on someone. You can probably tell that it has quite an effect on me. I’ve always felt that music and fiction complement each other perfectly – music can be almost as much about telling stories as books are; at their best, both can evoke entire worlds of atmosphere, culture and humanity in just a few well-chosen phrases. But you can’t ‘combine art forms’ on your own. And being a writer is maybe a more isolated job than being a musician. We all spend hours alone writing or practising, but I imagine that for Philippe, as for most violinists, collaboration is all in a day’s work. For a novelist, it’s not. So, when I met Philippe about six years ago and we decided to cook up a project to work on together, it was quite a new departure for me. How on earth does a writer collaborate with a violinist? Funnily enough, that first project was the one that hasn’t happened – yet. I don’t think we’ve given up entirely on the notion of making a film… but the central idea turned into a sort of scripted concert telling the story behind the story behind the Chausson Poeme, which is Philippe’s ‘signature’ work. It’s based on a story by Turgenev, one on which Turgenev’s relationship with the opera singer Pauline Viardot had a major impact. The story is called The Song of Triumphant Love; so was our concert, which involved Chausson, Viardot’s music and other composers from their world. It’s not a complete coincidence that my next novel, which is due out in July, is called Songs of Triumphant Love. Maybe Jeremy will let me come back and tell you more about that another time. Next Philippe commissioned me to write a short story for a CD booklet when he recorded the Mozart Sinfonia Concertante. He said he was going to ask me to do programme notes, but that’s boring – so he wanted a story instead! That was great fun and actually it’s the only short story I’ve written that I’ve been remotely pleased with. Next, he asked me to write a play about Messiaen to be performed before Messiaen’s Quartet for the End of Time. That was a lot more difficult and it went through a number of drafts and incarnations, but finally has hit the stage several times, first in French at Philippe’s festival in St Nazaire, once in the Lake District last summer where we performed it together, and it’s even gone to Australia. Meanwhile Philippe has fed me some of my best journalistic stories. 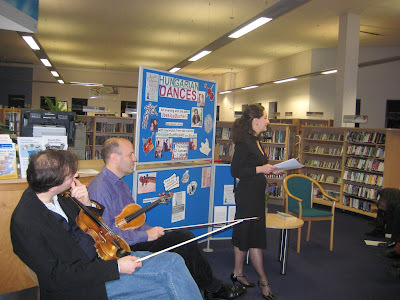 So by the time I started on Hungarian Dances in 2006, we were already a creative team. But I never actually expected him to get so involved in my ever-so-solitary novels. Hungarian Dances is my third novel and it’s not just the longest but also the most ambitious that I’ve attempted so far. My first two novels are not only about music but about modern family life crumbling under intolerable pressures from the often very artificial society around us. Hungarian Dances is a family story on a grand scale, crossing three generations of what I hope is a delightfully eccentric dynasty of Hungarian musicians who have migrated to Britain. Like the other two books, it’s about the way each generation’s individual experiences affect the others, the way psychological scars are unwittingly passed down through the family. It’s also about the experience of being a first-generation Brit, the clash of two different cultures – in this case Hungarianness and Britishness – and the way we learn to deal with each other, or don’t. There are second chances, new beginnings and the forging of new identities. They want music? They got music. Actually they got a lot more than they bargained for. It was the perfect excuse to home in on the violin, my favourite instrument, the one that opens the subconscious floodgates. It so happened that Philippe had just released a CD of 20th-century pieces influenced by Gypsy music and Hungarian players, entitled ‘In the Shade of Forests’. Quite unconsciously, that CD sparked off some crucial elements of the story. I realised only when I was half way through writing the novel that the little Gypsy girl who peers out of the back of a wagon on the CD’s front cover had got under my skin and grown into the character of Mimi Rácz, the Gypsy violinist who transcends her background and its traditions, but at a price… I soon found that the more I delved into the violin, the more everything pulled me towards Hungary. First, many of the great classical violin pedagogues of the 19th and early 20th century were Hungarian – Jozsef Joachim, Jeno Hubay, Leopold Auer, Carl Flesch and more. And alongside this great tradition, there coexisted a very different one: the Gypsy violinists whose playing is every bit as strong and seductive in its own way, but involving a wholly different approach to music-making. The novel’s heroine, Karina, is the daughter of two musicians who both escaped from Budapest during the Uprising in 1956. She’s born in London in 1970, where her parents have brought her up speaking no Hungarian and knowing almost nothing of her family’s background. Karina is a gifted violinist but has given up performing, to be a teacher, wife and mother; she’s married a very English lawyer, Julian, who’s the younger of two sons of an hereditary peer, and they have a seven-year-old son named Jamie. Karina’s grandmother was the famous Mimi – who was born into a family of Gypsy musicians in Hungary in 1915. Mimi, aged 10, was performing in a Budapest restaurant with her father’s café band when a philanthropic doctor heard her and decided to adopt her and send her to the Franz Liszt Academy to be transformed into a classical soloist. She was world famous by the age of 20. But her life involves secrets that have lain buried for decades – and they include not only a missing violin made by the great Nicolo Amati, but also missing family members and a long-concealed love affair with a French composer named Marc Duplessis. A series of crises leaves Karina questioning her sense of identity and desperate to learn more about who she really is. As she investigates what really happened to Mimi, her world changes and she finds not only the truth about her family but the truth about her inner self. As in the story of Bartók’s Cantata Profana, a legend of nine hunters who are transformed into stags, the very creature they hunt, Karina grows into the musician she is hunting as her own ideal. And her story and Mimi’s interweave and echo one another in ways that Karina doesn’t always suspect. Of my novels so far, this is the one that means the most to me, because it’s been one long, remarkable voyage of discovery. I often find that I’m spurred into writing by things that bug me in one way or another. ‘Rites of Spring’ and ‘Alicia’s Gift’ both dealt with issues that either made me angry or required a kind of catharsis, but in Hungarian Dances I started writing simply out of love and fascination. It’s been a process of opening and discovering, not wrapping things up, to the extent that it was really quite hard to let go of the book. I’m still finding ways to keep the process going. I’ve made a website devoted to the book and the associated CD including lots of stuff about Hungary, the recipes that Karina and her mother cook, some Youtube video of the 1956 revolution, and a bonus track for everyone to listen to free of Philippe playing Ravel’s Tzigane, which is from the Shade of Forests CD. It’s at www.hungariandances.co.uk. Meanwhile the incidents of life-imitating-art since I finished the book have been absolutely incredible. First, when I was completing the book a friend put me in touch with a Hungarian historian living in London. I asked her to read the manuscript and let me know if the historical context was reasonably OK, which she kindly did – but it turned out that not only is her husband the younger of two sons of an hereditary peer but they have one child, a boy whose name begins with J, and her husband’s middle name is Hilary, which in the book is the name of Karina’s husband’s brother. Next, I’d installed Mimi, aged 91, in a flat in Montagu Square in the West End of London, but not long ago I was introduced to an extraordinary Hungarian lady who is actually 93 going on 21, and she too lives in Montagu Square. Then last summer, Philippe phoned up. He told me that his old violin teacher in Paris, Devy Erlih, was about to turn 80 and had never received the recognition he deserved – couldn’t I do an interview with him for The Strad, which is the specialist journal for string players? So I did. Well, this amazing man is Jewish with Moldovian origins. His parents left Romania and settled in Paris where his father had a café orchestra, Devy learnt to play by ear and by the age of ten he was the star attraction in his father’s café orchestra. And someone walked in and heard him…. It all felt bizarrely familiar. Philippe and I met him in a restaurant in Paris, had a wonderful interview over lunch then went back to Mr Erlih’s flat to find some photos. And I couldn’t believe my eyes, because right next to his apartment block there was a restaurant called Chez Mimi. And there’s a lot more, the sort of things that are best revealed late at night over a good glass of Hungarian wine… It’s reached the point where I start to wonder just what will happen next. Of course, the CD happened. As far as I know, it’s the first time that an international classical star has decided to make a whole new album based around a novel. It all began because I asked Philippe to read the manuscript and tell me if there were any violinistic howlers. He read it, then invited me to lunch. And over a very wicked millefeuille he announced that the only thing wrong with the book was that it needed a CD to go with it, and he wanted to make this himself. He’s put together a very stirring and exciting programme of Hungarian and Hungarian-influenced music with a strong Gypsy element running through it. Some of the pieces are mentioned in the novel – Bartok’s duos and Romanian Dances, some Brahms Hungarian Dances and Monti’s Csardas, for example, so you can hear the pieces you’re reading about. The great Fritz Kreisler is also there, and Mimi meets him briefly. In the book, Mimi’s lover Marc Duplessis, who of course is fictional, writes her two pieces – a suite telling the story of her Gypsy childhood, which I named ‘Dans l’ombre des forets’ after Philippe’s previous CD; and a concerto in Gypsy style – which is lost, along with her Amati. As in life, some things are found, others are not. But Philippe found Marc Duplessis’s lost concerto and played it to me in my front room – a piece which I had never heard before and which was exactly as I had imagined Marc Duplessis’s concerto. It’s by Dohnányi and it’s called Andante Rubato alla Zingaresca. At that stage of production, I still had time to make a couple of changes, so the fictional piece acquired the title Andante amoroso alla Zingaresca and it’s the first piece you hear on the CD. The process wasn’t all fun and games, though. Last summer turned out not to be easy for anyone and the odds against the recording actually happening were stacked extremely high. At times it looked as if everything was going wrong – for instance the day Tom went to Holland to record the duos with Philippe, everything really did go wrong, including a train being turned back because of an accident on the line. But Philippe pulled the disc off nonetheless and I have to say that when I first started listening to it I turned very wobbly. It seemed to me that Philippe has created in this disc exactly the atmosphere I’d wanted to create in the book; that not only did he understand everything I’d wanted to do with the book, but he’d also found the same ‘dream-pool’ and jumped straight into it too. I dived in and came up with a novel; he dived in and came up with his CD. As a writer it’s rare to collaborate – but to find that someone has decided to dream your dream together with you is simply indescribable. Last night (Wednesday) Philippe had a big concert at the Wigmore Hall and he played the Chausson Poeme, the piece based on The Song of Triumphant Love. Hearing him play this wonderful music is like the feeling you get when you see a coral island, or a glimpse of the Himalayas, or an ancient Indian temple, or the Monet Waterlilies in Paris. While it lasts, you try to implant it deeply into your mind and your heart so that it can stay with you, and later it’s there to sustain you – you can remember that this was real, that this moment of absolute beauty and wonder is something true and possible and it can renew itself again and again and reconnect you with these mysterious creative forces that make life worth living. That’s why sometimes writers need musicians, and that’s why I am so completely overwhelmed that someone capable of such artistry has put so much effort into diving into my Hungarian pool and found such wonders lurking in its depths. As long as this is possible, it’s very difficult to run out of dreams. The other day, travelling home on the train, I found myself next to a gentleman who had just bought, and was reading, a large, highly illustrated, full-colour edition of The Origin of Species. I peered over his shoulder at it for the whole 20-minute journey, entranced. Luckily he didn't mind and was only too happy to share this treasure. The sense of wonder that emanates from Darwin's prose manages to be both balanced and ecstatic - an ideal way of being, perhaps. Marvellous. My neighbour told me he had bought the book at the Darwin Exhibition at the Natural History Museum, which he recommended most highly. I'll be along there as soon as I have a free moment. Lots to explore meanwhile. Do please come and hear Philippe Graffin & the London Sinfonietta at the Wigmore Hall tonight if you're within concerting distance of central London. Philippe found the chamber-music version of the Chausson Poeme hiding somewhere in Paris sometime in the 1990s and it doesn't have many London airings, so this is a rare chance to hear it. It is incredibly beautiful - the effect, compared to the full orchestra version, has the same intriguing charm as listening to a 78 instead of an LP, or watching a black & white reel-to-reel movie rather than Blu-Ray. And, of course, we've got the library gig tomorrow. This was what I sat through & wrote about. Given that I loathe and detest Carmina Burana with a passion I've never bothered to hide, and the music was the star of the evening, you can imagine what the rest was really like. The sub-head isn't mine, as you'll gather from the fact that the review makes it clear that CB is neither an opera nor a romp. This staging was, generally, more CBeebies than CB. The lighting was pretty, though, and I thought it deserved a good mensh, as did the poor old RPO. To judge from the comments on the Indy blogs, everyone else hated the whole thing. I can't guarantee much blogging until next week (though will post any of my articles appearing meanwhile). Please have fun with the blogroll - newbies include the blogs of ace pianists Stephen Hough and Jonathan Biss, plus Sebastian's LondonJazz blog for all aficionados. ...Philippe. No, not that Philippe. This is Philippe the Giant Schnauzer (pictured left), the cuddly canine who was creme de la creme, 'Best Dog', at Crufts Dog Show last year. (If you haven't seen Best In Show yet, it's worth a rent...). 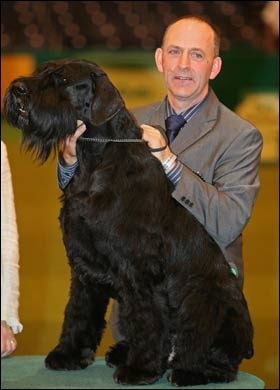 So, what has Philippe the Giant Schnauzer got to do with Die tote Stadt? The point is the judging system used to pick top dogs at Crufts. Apropos of this, the Pedigree Chums at Crufts have fallen foul of Political Correctness recently and have either been banned from TV or been banned and reinstated, I'm not sure which, because breeding a creature according to absolute standards for its pedigree apparently has some uncomfortable associations with the Second World War, Eugenics et al, and, besides isn't especially healthy in genetic terms. Nevertheless, we in music can learn a lesson from another angle, which picks up on my point the other day about not judging composer by what they are not, instead of what they are. The dogs in Crufts are not judged against each other. They are judged according to the ideal for their individual breed. So, while music competitions, music critics et al constantly pit like against unlike, making all such comparisons personal, unfair and often spurious, the issue isn't whether a Giant Schnauzer plays the Mendelssohn Violin Concerto better than a Golden Retriever or whether a Beagle happens to writes tonal music in the same decade in which a Prize Poodle is busy creating tone-rows. If that Beagle matches up to his Beagledom better than the Prize Poodle does to his Pootling, he gets the medal. I am glad to say that Best in Show was made by Warner Brothers, the same company that saved Korngold's life. Happy Sunday, all. I'm off to the Royal Festival Hall this afternoon to interview Stephen Hough live on stage after his absolutely fabulous Cortot-inspired recital, which is full of delectable Chopin, Faure and Franck. Meanwhile tickets for Crufts 2009 at the NEC in Birmingham are now on sale. Sobering news in the New York Times today that the Met is in financial straits, its endowment hit by the massive drop in the Dow Jones. Just as it was riding high in the opera world, the Metropolitan Opera has been bludgeoned by the recession and now faces a “disaster scenario” unless the company finds major cost cuts, including concessions from its powerful unions, the Met’s general manager, Peter Gelb, said on Thursday. Perhaps those who have advocated American-style privatisaion of the arts world ever since the days of Margaret Thatcher will now have to think again. You can't run a nation's cultural life (I mean 'culture' in the old-fashioned sense when it meant culture) on fairy gold that melts away at dawn. On the other hand, the government is now facing the very likely nationalisation of various banks, a huge bill for unemployment benefit and, heaven help us, the 2012 Olympics. If they decide to divest themselves of some financial minnows along the way, we shouldn't be too surprised. And who, in the Labour goverment, cares anything for the arts? David Miliband's wife is a violinist, but beyond that, um... But replace that with 'who, in the Tory government, cares anything for the arts?' and it'll be time for us all to put on our boxing gloves. Start limbering up at the sandbags now, chaps, so that you are in good fighting shape when the match begins. Fabulous piece in today's Guardian from Tim Ashley, interviewing maestro Ingo Metzmacher about Korngold's Die tote Stadt, now fast approaching Covent Garden. Music, by its very nature, is about the persistence of memory. "People remember," Ingo Metzmacher remarks. "We hear something, remember it and recognise it again. It's the memories in this piece that hold it together." Metzmacher, chief conductor of Berlin's Deutsches Symphonie Orchester and a radical interpreter of the 20th-century avant garde, is talking about Erich Wolfgang Korngold's opera Die Tote Stadt: he conducts its first - long overdue - UK staging at Covent Garden later this month. It was once very popular, taking the German-speaking world by storm at its simultaneous premieres in Hamburg and Cologne in 1920. Korngold, the wunderkind son of a prominent Viennese music critic, was 23 at the time, and had produced something that touched a raw nerve with a generation struggling to come to terms with the catastrophe of the first world war. The opera is ultimately about how the past irrevocably colours our present and our future - and also has the potential to destroy us, both individually and socially, if we fail to release ourselves from its influence. Meanwhile, Norman Lebrecht produced an interesting effort in the Standard the other day - the paper is still more or less unaffected by becoming the latest plaything of an ex-KGB Russian billionaire... but there are a few howlers. "...a promising talent who had been touted as the next Mozart ever since Gustav Mahler gave him a ballet commission when he was a kid of nine." But Mahler didn't commission anything from baby Korngold, merely called him a genius and advised that he should study with Zemlinsky. And to suggest, as he does later, that DTS is about current affairs is a bit far-fetched, since most of the action takes place during an extended dream sequence. The parallel between Rodenbach's stagnant Bruges and post-WW1 Vienna is entirely subliminal - which is probably why it works. As for Ivan Hewett in The Telegraph... though I admire Ivan most of the time, much of this article reads like the same old received opinion that has plagued Korngold since the 1940s, namely that there was something wrong with him for not being Schoenberg. "Don't expect apples from an apricot tree," was Korngold's own rebuttal of that charge. We've heard it all before, and will no doubt hear it many more times before February is out. As it happens, the two composers later became great buddies in Hollywood. Korngold is not the first composer to be judged by what he wasn't, rather than what he was. Among others is Schubert, who has never been forgiven for not being Beethoven; Liszt, who some people seem to think should have been Chopin; and our darling Mendelssohn, who was in many ways a better composer than Schumann but committed the double-whammy error of being born Jewish and subsequently becoming a genuine, not just expedient, convert to Christianity, thereby rubbing everyone up the wrong way. Such judgments damage reputations, and quite unnecessarily: they blind the critic to whatever positive qualities an artist may be offering on his own terms, qualities which may need the critic to have enough imagination to accept a different perspective. Why should Schubert be Beethoven, when Beethoven could never have written Winterreise? Incidentally, Ivan is also rather misguided when he suggests that Korngold couldn't be bothered to go to hear other people's music; he was, for example, mad about Stravinsky. His father was horrified when the wunderkind dared to enjoy a performance of Petrushka. Julius Korngold, perhaps the worst psychologist in the history of music criticism (which is really saying something! ), was entirely responsible for holding his son EWK back from the dangerous new developments around him. Indeed, he wasn't even allowed to cross the road alone until well into his teens. And if he didn't go to as many concerts as his critic father, that was probably because he was busy composing or performing. To suggest that he 'preferred to immerse himself in a fantasy' in Hollywood is also a false direction. Korngold wasn't a fantasist: he was one of the finest musical craftsmen of his day, which is why he did so well in the film world, and this ability to interact with another art form to such a degree is a sure indication that he must have had his feet relatively well on the ground. Frankly, if he didn't work as much as he should or could have, that was most likely because he was utterly depressed. And no wonder. Mad props to Tom Service at The Guardian and the redoubtable Opera Chic for picking up on the Mendelssohn mystery. A coupla points in response. First of all, Tom S says Mendelssohn was nursing an 'unrequited' passion for Lind. The point is, it was requited, and evidence is said to point to an affair between the two, who went down the Rhine together on a boat, which...but that's a long story. Nevertheless, the affair required squashing, given both their reputations and Mendelssohn's family situation. It wasn't just an unrequited crush, but a genuine lost love. And even it's true that a composer's music is not directly connected to his/her biography as such, it is necessarily connected to his mind, personality and general state of being, because every note on the page is the product of a personal choice on the composer's part. We've been over this many times here in the blogosphere. The modernist camp especially will deny every jot of it. Everyone would love it not to be the case, musicologically speaking, since that gives us carte blanche to consider only the notes and not the person who wrote them. I have never been comfortable with that. Would a non-obsessive, stable individual have written Schumann's unbalanced, stream-of-consciousness works with their impossibly repetitive rhythms? Could someone who was not torn apart by the prospect of early and loveless death have written 'Die schone Mullerin' and 'Winterreise' with the devastating power of Schubert? Could someone not prepared to fight for art, humanity and idealism ever have dreamed up Beethoven's Ninth Symphony? Could a non-megalomaniac have written the 'Ring Cycle'? What about Messiaen, religion and birdsong? This could go on and on. Mendelssohn was more controlled than most, more self-contained and self-effacing, having fewer such battles in his life until the very end; but would someone not thrilled by the atmospheres of Italy and Scotland have written those symphonies? Would someone normally so cheerful and energetic have produced that last, devastating string quartet? Now, I'm a 'creator' of sorts too and I know from the inside that what and how I choose to write can tell you much more about me than I'd like. For example: I am obsessive. I try to do too much. I consider myself lazy and should wear my glasses more often. I am easily spellbound. I am a dreamer and sometimes ought to get my feet more firmly back to earth. I have a 'thing' about the violin. I am rather an outsider, like to stand back and observe, and slightly enjoy being quietly subversive. I am drawn to difficult and recovering places, histories and people, and yes, this is indeed because I have experienced difficult times that still require recovery, which has been much aided by music, art, writing etc. There is not one directly autobiographical sentence in any of my novels, nor a single character who is based entirely on a real person; yet everything from the story structure to the specific word is there because I chose it, for better or worse, and each is, I imagine, the sum total of a lifetime-so-far's experience and what I've learned to date about human nature. I have no reason to imagine that a composer would function especially differently. With the one proviso that, as Tom S quotes, in Mendelssohn's words, "It's not that music is too imprecise for words, but too precise." Perhaps this helps or perhaps it doesn't, but that's my 2 1/2p for what it's worth. I promised some news from the Mendelssohn camp, and here it is. Come over to the Indy now and have a look at my feature. I don't know how any musician gets any listener out of their warm home through freezing temperatures and shaky bank accounts to a concert hall just at the moment. But here, for those inclined to brave the elements, are a few things that my muso-friends and I are doing this month. Tonight, 11 January, Kings Place, 6.30pm, part of London Chamber Music Series: the Allegri String Quartet gives its first concert in the shiny new venue, starring the Schubert String Quintet with guest cellist Colin Carr and the London premiere of the redoubtable Matthew Taylor's String Quartet No.6. Friday 16 January, Royal Festival Hall: The LPO is back, welcoming one of my favourite younger pianists as soloist for Mozart's E flat concerto K482: Jonathan Biss, who not only has an astonishing musical pedigree (mother Miriam Fried, grandmother Raya Garbusova, etc) but possesses the heart, mind and hands to match. His playing has regularly set me hunting through thesauri for rare words of praise. His Schumann CD on EMI is absolutely to die for. And guess what? He's got a blog. ...oh yes, the concert... Marin Alsop conducts and is throwing in not only Till Eulenspiegel and the Daphnis and Chloe Suite but the Firebird Suite as well, so if that doesn't brighten our winter, nothing will. Next Sunday, 18 January, Royal Festival Hall, 3pm: Stephen Hough, multiple award-winner, startlingly original and insightful musician and, now, fellow blogger (yay! another great pianist joins the blogosphere! even if it is for the Telegraph...) gives a wonderful recital programme to banish the Sunday afternoon blues - lots of Chopin, Franck and Faure, among other things, focusing on the theme of Paris and paying tribute to one of Hough's piano gods, Alfred Cortot. I've been drafted in to be his interviewer for a post-concert talk...you may have some difficulty shutting us up when we get into our stride. Wednesday 21 January, Wigmore Hall: Philippe Graffin and the London Sinfonietta mark the Darwin Anniversary with a brand-new work, 'Age of Wonders' by Michael Stimpson, plus Mendelssohn and Chausson. They are brave: it is sad but true that getting a Wigmore Hall audience to attend new music is almost as difficult as getting a new music audience to attend the Wigmore Hall, though the super-classy venue is currently making a valiant effort to change that by instigating an ongoing series of new commissions. Come on, chaps, give it a go! Besides, the Chausson in question is the Poeme in the rare chamber-music version that Philippe discovered lurking in the Parisian shadows some years ago; and the Mendelssohn is the Violin Sonata that our Felix wrote when he was all of 11 years old: two pieces that we don't hear every day. Thursday 22 January, Wigmore Hall: the above prior engagement means that I have to miss the latest flying visit from the legendary Ida Haendel to the Razumovsky Ensemble and Academy! At this all-day event, the great lady will be giving masterclasses to the students and young artists of the RA, of which she's now the Patron, and at the 6pm concert she'll present the Ida Haendel Scholarship to one of them. She will also be performing with them, notably the Devil's Trill Sonata by Tartini. The 7.30pm concert finds the Razumovskys performing an all-Schubert programme, with the B flat Piano Trio and the 'Trout' Quintet. Tuesday 27 January, Royal Opera House: The British stage premiere of Korngold's Die tote Stadt! It's true! The acclaimed Willy Decker production, already seen in Vienna and Salzburg, opens at Covent Garden starring Nadja Michael as Marietta/Marie, Stephen Gould as Paul and Gerald Finlay as Frank/Pierrot, with Ingo Metzmacher on the podium. I'll be at the 2 February performance and will make a full report after that. Performances up to 13 Feb. Meanwhile, catch our ROH podcast on the website...if I can get them to fix the faulty link. That should keep us all busy, and January will be over for another year before you can say 'Erich Wolfgang Korngold'. Latest post on my BBC R3 Mendelssohn blog is on the site now. If you register at Metrotwin.com before 15 January you could win a pair of return economy flights to New York and three nights in The Plaza New York. Conditions apply. HAPPY NEW YEAR, EVERYONE. 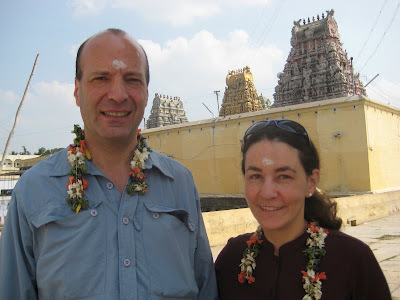 We are just back from south India. I hope you've all had an excellent Xmas and wish you health, happiness and peace in 2009. That units of measurement include a 'lac' (100,000) and a 'karu' (10 million) - London is a small city in Indian terms. Ayurvedic hair oil (well, I did - Tom doesn't have hair). It works. An intriguing concoction that arrived when I requested peppermint tea: a stew of Tetley's, a handful of mint leaves and about 2 tablespoons of black peppercorns. Terrified on the roads: overtaking is a way of life, whether you're a bus, a truck, an ox-cart, a car, a motorcycle, a rickshaw, a bicycle or an elephant, and traffic lights are in short supply. Saddened by the plethora of ingrained attitudes that nevertheless seem to hold everything back. India is a succession of priceless gems strung together on a decaying thread. Marvel after marvel, linked by disastrous infrastructure.